After all the wet, cool, cloudy days in May and June (and even well into July), we've finally gotten some good hot days. My tomatoes were growing bushy and green with few flowers, and now I'm seeing some fruit in there. The kale and rainbow chard are going crazy, and while I only have two surviving squash plants, they are Zephyrs and they are giving us four to six small yellow fruit every other day or so. We're trying to pick them at about 6" to stay ahead but I suspect we will be overrun soonish. I seem to have planted a lot more jalapeno-style peppers than I meant to... I thought there were more bell-type peppers, but so far only one (the merlot) seems to be producing. Hi- I have some green onions ready to pick, and normally I would have some tomatoes, but because of all the cold weather we have had this summer they are not ready yet. I was hoping my Juliets would be ripe enough to eat, but they are still green, hopefully they will get ripe this week with all the hot weather we are expected to have. There is also a plant that I piicked up at the farmer's market in June for $1, that might have some ripe tomatoes this week too. 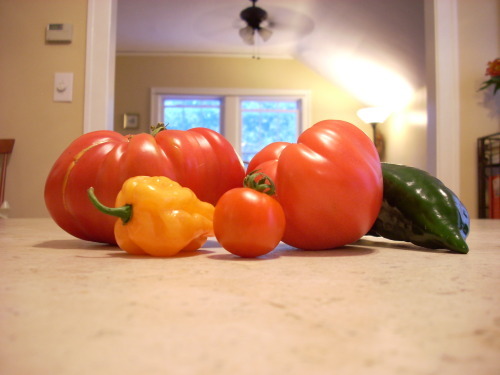 Normally I would have some sungold which I love, but Anton's were out when I went there to purchase one. My broccoli flowered on me, but I picked the flowers, and hopefully the rest of the plant will produce. The plants were too mature when I purchased them at Anton's. I am going to try to plant some Japanese turnips this week, and some more green onions as well as some Asian greens. Our peppers are really coming in well as is our cabbage. Tomatoes are still slow. Carrots and potatoes care growing nicely. All herbs are growing like weeds. Have lost some container lettuce as i did not pick early enough and did not keep it watered during the drought this week. I picked a thai chile. Flavorful, but no heat. Needs more stress. Tomaters are all still green. Lots of big empty envelopes on the tomatillos, typical for this time of year. Gai Lan and Lascinato Kale leaves plentiful, although the stalks are thin and woody. My garden has gone insane. Lots of peas, more broccoli leaves than I know what to do with, and I should really pick the rest of the beets and see what the carrots are up to. 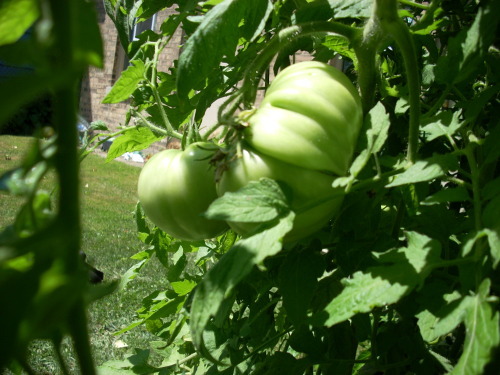 Tomatoes are starting to fruit, finally, but none ripe yet (but yes, it is at least theoretically possible to direct-sow tomatoes in Chicago, apparently). 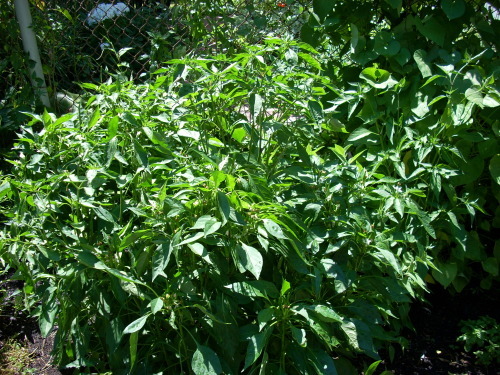 Sage has gone insane, and basil and mint are not far behind. Squash leaves are everywhere, no matter how much I prune them. And I thought I could convince them to grow up a trellis, but they refuse to be contained. Something is growing up the other trellis, too; I think (and hope) it's the melons. Lots of flowers, but no fruit so far. The 2 squash and 2 cucumber seedlings that I gave my neighbor have now taken over her entire bed and are encroaching into the bed on the other side of hers. The peppers and eggplants didn't do much of anything, probably because they are too well-shaded by the tomatoes and squashes. Neither did the amaranth, which I probably won't bother trying to grow again. I finally ripped out the mixed salad greens, which were starting to bolt, and shared the abundance with a co-worker. The cauliflower and romanesco are showing signs of little tiny heads - I should probably thin those out, too. Can those leaves also be eaten like broccoli leaves? The moral of the story: I probably should have planted less stuff, but hey, it's a learning experience and I'm not feeling very goal-oriented about it. I still have seeds for a later crop: cabbage, broccoli rabe, and kale, which I will plant if we ever manage to eat al this other stuff, maybe a row of broccoli rabe where I am about to pull out the beets, and start the cabbages where I already pulled out the salad greens? But I wanted a big variety of stuff. Maybe next year, I will plant only partial packets of seeds, either split packets with someone or save some for later - how long can I keep them before they lose potency? We've gone through three crops of Rainbow Chard. We've put away a few small batches of basil and had good luck with a couple of kinds of eggplant. We've harvested a few dozen yellow cherry tomatoes. Tiny Thai peppers have changed color. Other tomatoes and peppers are coming along well but there is no color yet. We planted Mommagotcha's jewel corn VERY late but it is showing promise. Does anyone have any ideas on what to do with borage? Does anyone have any ideas on what to do with borage? Rip it out before it reseeds. Supposedly you can candy the flowers, but it's such a garden thug it's just not worth it. BTW, wear gloves when you rip it out. Been there. It's growing in the east side of the garage where nothing would grow before, so I'm tempted to leave it as it fills out the weeds. Apparently it is a laxative, so I try and keep the dog away from it. Candying the flowers sounds attractive, but then what would happen? NFriday wrote: Hi- It is too late to start cabbage. If you had plants ready to put in the ground that might be a different story. How do you still have peas? Are these regular peas or sugar snap peas? Peas in general don't like hot weather, and the plants do not survive in the kind of weather we have been having this week. I have no idea how they have made it this far. A couple of the vines are looking pretty unhappy, but the others are still producing. They were snow peas, and they are now looking much more like regular peas, but they are still edible, so I certainly plan to eat them! As far as cabbages, I am finding a number of sources that say some varieties can be planted in summer for a late fall harvest, so I will give it a try. The seed packet was only a buck or so, so I don't have much to lose. This year has been a mixed bag for us. We had a great early spring, with loads of peas, radishes, and greens. Late spring is always a little slow - cucumbers and tomatoes aren't in yet, but many greens have bolted. Herbs have been doing great all year. The biggest problem we've had is a rat infestation in our neighborhood (probably due to a business across the alley that doesn't secure it's dumpster). They moved into the garden as soon as the first tomato started to ripen, and devoured loads of them. Many things have been left untouched (herbs, corn, arugula, mizuna, radishes) but they destroyed our tomatoes, soy/edamame, peppers, and eggplant. Using extreme measures I got them under control a few weeks ago, and we're finally getting tomatoes, but it's been a bit of a frustrating year for the garden. 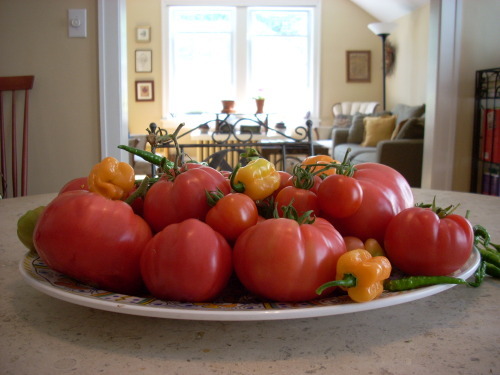 It’s August 22, 76 and sunny outside, and there was plenty ripe for the picking in the garden this morning. (For scale, the platter is 15 1/2″ wide.) It’s simply wonderful having enough fully ripe tomatoes on hand to make both a big Caprese salad (or a huge messy sandwich!) AND a huge batch of incendiary Pico de Gallo - those Thai and Santaka chiles to the left are earmarked for the latter. The small tomatoes will go into an Orecchiette pasta, along with fresh basil, tiny balls of fresh mozzarella, and Pecorino Romano. I'll be committing the first batch of the "Mortgage Lifter" seconds to the freezer this week. Best way to preserve A+ tomatoes for winter use, IMO. Easy, fast - and they self-peel when thawed. Well, some kind of blight has mostly done in the cucumbers, squashes, and melons, and I finally gave up and ripped out most of the squash plants. We did get a few cucumbers and squashes before they went kaput. We have a ton of broccoli leaves, but not much in the way of heads - I have made a lot of stir-fry and a successful round of broccoli-leaf gratin, but what else can I do with them? I don't think I will bother with beets or carrots again - they are cheap at the store. We still have a hedge of chives, and I also ripped out a bunch of sage, because it was taking over. 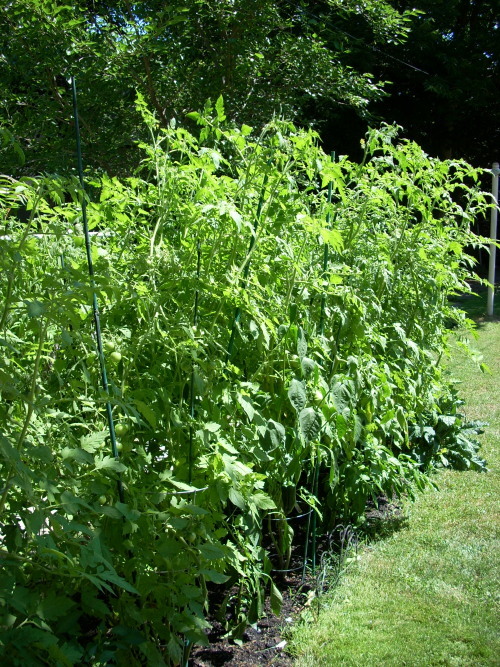 The tomatoes are now taller than my 6'2" husband, and are fruiting nicely, but few ripe ones just yet (which is what happens if you direct-seed in May, I guess - that's fine, but hopefully we will have better luck next year). I think next year for mid-season we may just stick to herbs, tomatoes, peppers, and eggplants, all of which we can use in pretty much indefinite quantities, and maybe I will give the peas and melons another go. And we can do more cool-season stuff, like greens and lettuce and broccoli rabe and radishes and kale. I still have a couple of packets of kale and a couple of broccoli rabe that I'm going to put in tomorrow where I've ripped out other things. Cukes, squash, etc. don't like damp and don't do well when crowded--both of which could've been an issue for you. Same for tomatoes. Though the cool damp start in June was actually really good for mine but I have each plant in its own container so I was able to keep them well apart when it was rainy for days on end--though I had a different problem in that I struggled to keep the buckets upright during some of those storms. But I'm rolling in tomatoes now--I have 14 different varieties planted and I'd say that, conservatively, I've probably already harvested over 30 lbs of tomatoes with lots of fruit still on the plants. Eggplant produced moderately (a good thing--too much eggplant is hard to deal with), squash didn't do a lot (I had same problems--too damp, not enough space which led to mildew), lots of pickles and Persian cukes, beautiful peppers (green bell and a bunch of different chilis), pounds of ground cherries, tons of tomatillos, good potato and onion harvests, corn is meh, greens good. All told this was by far the best year I've had in 14 years of deck gardening. I planted a lot more flowers than I had in the past and had/still have the fattest, happiest bees I've ever seen up here. Assuming that and the weather which was pretty ideal for containers contributed. So tell me about ground cherries. What are they like, and what do you do with them? I was curious this year, but decided against them. But they would fit nicely into my focus of planting things that are either expensive to buy, best when fresh-picked, or hard to find elsewhere. I love them-they're very easy to grow, nothing really seems to bother them. They do take up a lot of room though--I wouldn't recommend them for a raised bed. I have mine in individual pots. They're basically a berry--so you can pretty much use them like you'd use blueberries, texturally. Flavor wise, they're kind of a cross between grape, pineapple and sun gold tomato. Last week, mbh used them, along with sour cherries, in a clafoutis. They make great jam, chutney, sauce for pork. I like to just eat them by the handful. The only thing we are managing to grow this year is some rogue basil that is coming up between the patio pavers. Life got in the way of being able to plant anything. I was pretty happy when I saw the two little basil plants today! Yep. Life got in the way also on this end. Still it looks like I will be successful with broccoli. I actually had someone ask what this was. Still have Italian parsley, chives, sage, oregano and Thai basil. My volunteer cherry tomato plant is going strong as it has clung for dear life against evergreen bushes. Still have a bunch of Scotch Bonnets that are yellowish red. 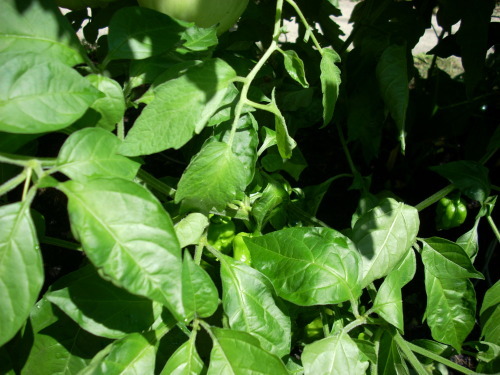 Hungarian pepper and green pepper plants have made a few more peppers but time will tell if they will ripen. Ready to clear it all away and spread mushroon compost from River Valley Farms (Wisconsin) for the winter. I filled a large plastic shopping bag with lacinato kale and gai lan (Chinese Broccoli) leaves. The stalks on the gai lan are rather woody, I haven't found them worthwhile, but I've got tons of leaves. There are still two yellow blush tomatoes that ripened on the countertop, but they're not nearly as tasty as September ones... they still beat the average supermarket pinkies, though. 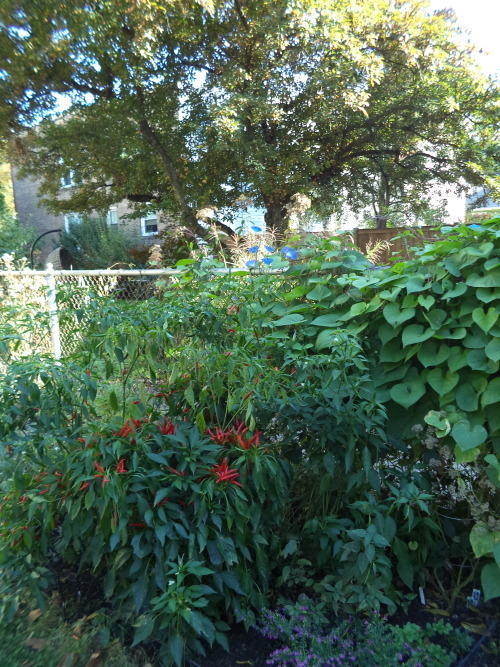 We still have volunteer cherry tnomatoes and a few peppers- Italian parsley, sage and chives still strong. Going to try and pick all but sage before this weekend's snow. I just picked almost five pounds of little fish, jalapeno, and serrano peppers. I think I'm doing a little pickling soon! I'm down to my last Mortgage Lifter tomato, plus about a dozen cherries. I suppose that's OK, considering that it's December 6th. The Cavolo Nero (dinosaur kale), however, is still happily perking along, especially since any cabbage moths/caterpillars are long gone. Can't kill this stuff with a shovel - and an occasional frost does seem to improve the flavor, just as gardening folklore says. Looking forward to another batch of sausage and white bean soup next weekend, as the kale is a great add-in. ETA: That last Mortgage Lifter is now being eaten for dinner as a BLAT (bacon, lettuce, avocado, and tomato) sandwich. One last delicious bite of summer on a gloomy December day. . .